Pop Culture Lunch Box: Are Politics Making Neil Young's Brain Mushy? Neil Young's umpteenth album is streaming in full on his My Space page. Now, of course he's put out some of the greatest music in rock history, but ever since his understandable dismay in the George W. administration, Young seems to be getting more and more political in his songwriting. 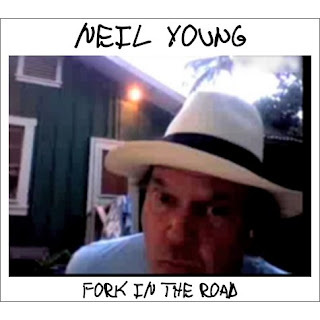 His surliness is displayed in all its glory on this new album, called Fork in the Road. And while there's nothing wrong with surliness, this album is just plain unpleasant. Seems like Neil Young is increasingly forgetting how to write a good riff. Too bad. At least my iTunes library is stacked with great NY albums.